Hello everyone! I'm back again for another review!! I know I've been super weird with my blog uploads, and I'm very sorry about that, but my life has been hectic. Let's get into this review shall we! 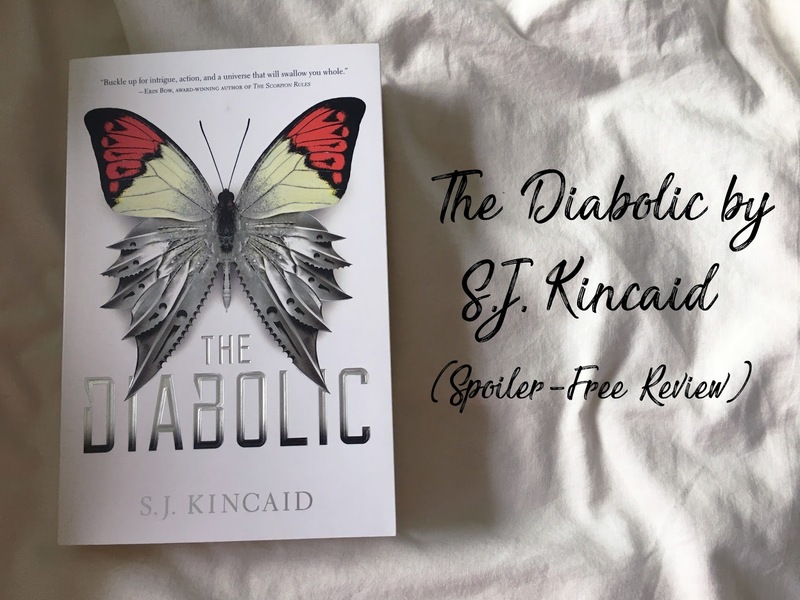 This review is going to cover my thoughts about The Diabolic by S.J. Kincaid! This novel follows the story of Nemesis. Nemesis is a diabolic, which basically means that she was made to protect one person. This protection consists of killing for them, dying for them, and doing all things necessary to ensure their well being. The plot picks up when the Emperor plans for Sidonia, the girl Nemesis is made to protect, to go to his court as a hostage. Nemesis goes in her place and all things go haywire from there. No one can know Nemesis has taken Sidonia's place, so she needs to ensure that she doesn't show anyone her true colours. Nemesis doesn't really expect to end up feeling things she's not supposed to feel. Nemesis is an incredible character. You don't expect to love her as much as you do by the end of the book, and additionally you don't expect the things from her that you see. Nemesis is made, she's made to protect Sidonia and that is all that is on her mind when she decides to go in Sidonia's place to the Emperor's court. Throughout this novel you see a lot of growth and change from Nemesis and it's really interesting to see how her views and opinions change as the story progresses. I don't want to mention more characters because mentioning anything about them is a spoiler in it's own right. So I'll leave my character talk with Nemesis, but do know that there are many amazing characters in this novel and you will love many of them. I really enjoyed this book, but my enjoyment started pretty late into the novel. I picked it up anticipating action and interesting information from the get-go, but that's not what I received. Unfortunately the beginning of this novel didn't interest me as much as I'd hoped, but after I got over that initial lull in the story, it was amazing to read. This novel has a lot of information that you think you know, and then end up realizing that you were wrong all along and that what you've thought to be true is actually untrue. I felt this a lot as I read this novel and it didn't deter my reading but it was a bit of a surprise every time it happened. Additionally I have to say that there are a lot of characters that you'll love in this novel, and just as many that you'll hate. S.J. Kincaid does a great job in creating a reading experience in which your opinions on characters can be true and cemented with little change. Lastly I'd like to mention that this novel also did a great job at keeping me on my toes, there were a lot of moments where I was surprised at the outcome and shocked to see what happened. The romance was one example of this where I didn't know how exactly it would really end up. That concludes my Spoiler Free Review of The Diabolic by S.J. Kincaid! I hope you enjoyed and see you next time for my next post! !